Imagine a world without smartphones or tablets, where the only way to get online is through your laptop or desktop. How much would your life change? Without mobile devices, our lives would be dramatically altered — as would the Internet. Now that mobile accounts for around 60% of total Internet traffic, we wondered what the web would be like if these devices somehow ceased to exist. 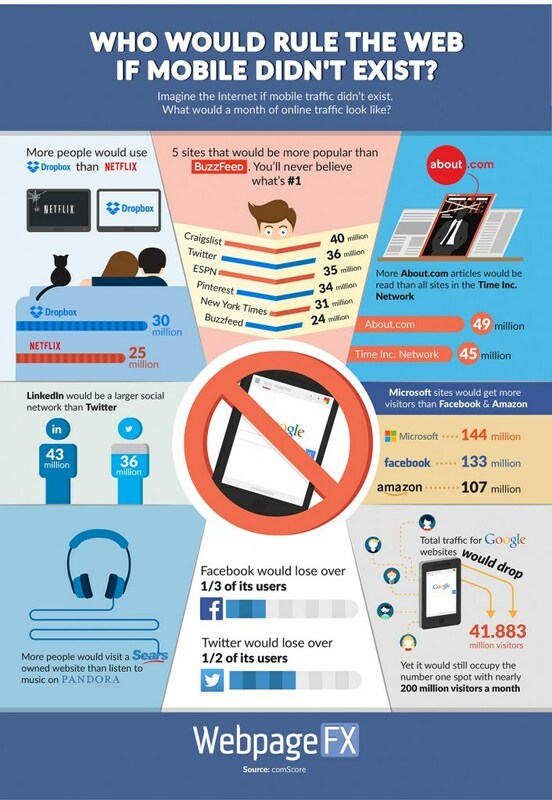 Which websites would dominate, and which would lose all their visitors? We found the results of our research so fascinating that we couldn’t help but share them with you! Here’s a closer look at what a typical month would be like without mobile Internet, and who would rule the web if mobile devices didn’t exist. Streaming video providers like Netflix and Hulu don’t just entertain subscribers on their TVs and computers — they also offer video on the go. Without mobile traffic, Netflix’s monthly user base would drop dramatically, falling from 57 million monthly users to just over 25 million. 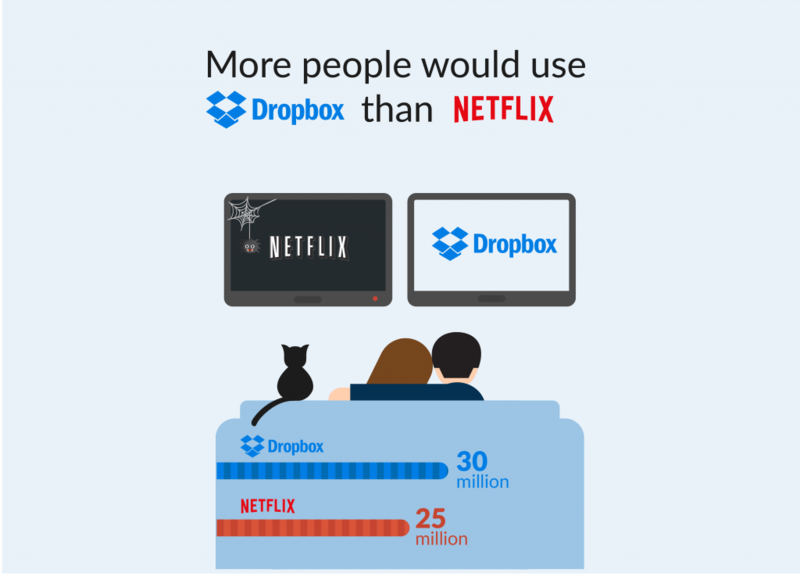 Along with Dropbox, which would retain 30 million monthly desktop users, Fox News, Best Buy, and Verizon would also have enough traffic to beat out Netflix. craigslist, the public bulletin board with a design that’s fresh out of 1998, would lose approximately 14 million of its monthly users if mobile traffic were to be wiped out. However, they fare much better than publishing giant BuzzFeed, who would lose two thirds of its 76 million monthly readers. 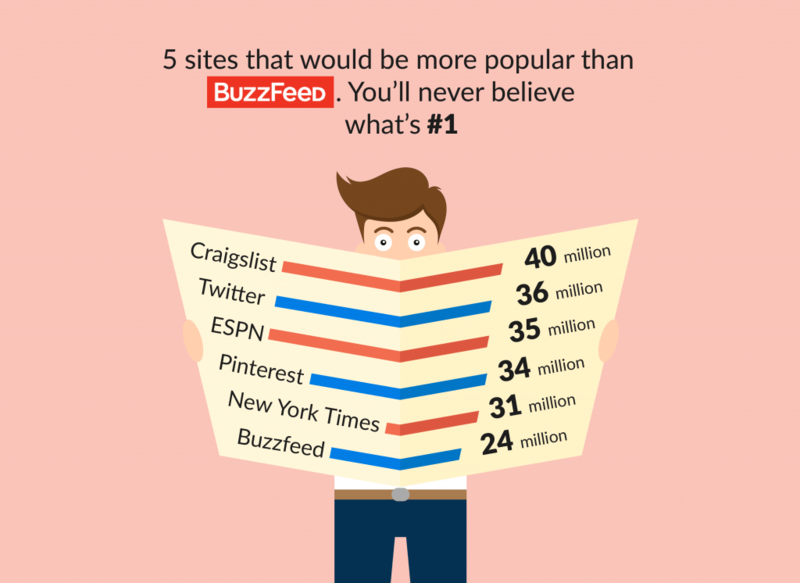 Without mobile traffic, more people would read the New York Times and ESPN than BuzzFeed. This speaks volumes of BuzzFeed’s popularity, despite only being around since 2006. Another interesting fact: without mobile, craigslist would also have more monthly visitors than Twitter! 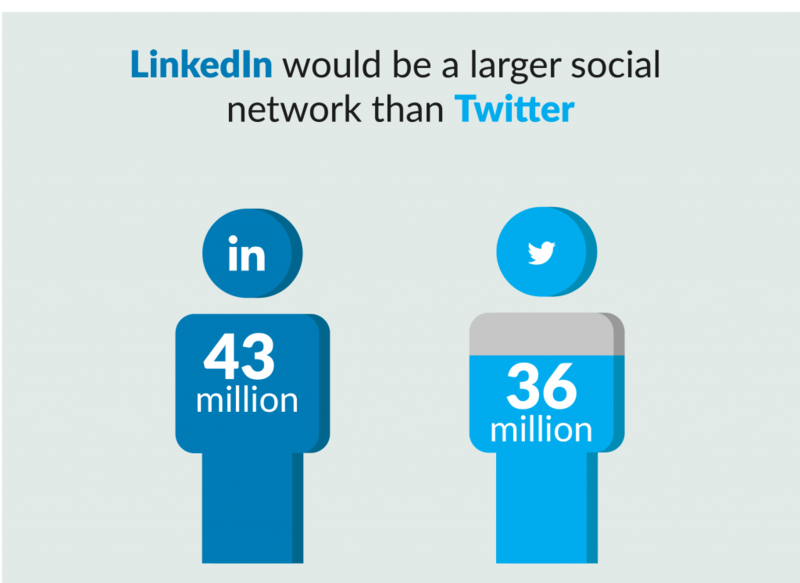 Currently, Twitter and LinkedIn aren’t that far apart as far as monthly traffic is concerned, with approximately 88 and 84 million active users, respectively. But with mobile out of the picture, it’s a completely different story: Twitter would lose more than half of its increasingly mobile user base, falling to 36 million monthly users. Another fun fact: without mobile Internet, Twitter would just barely have enough monthly desktop traffic to edge out Answers.com. Pinterest would also not be far behind, with a respectable 34 million monthly desktop users still hanging on. 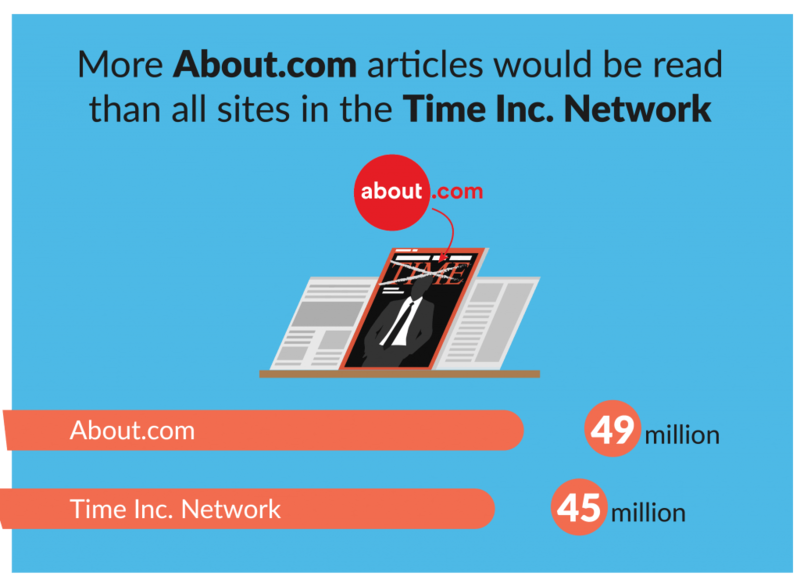 The websites in the Time, Inc. Network (which include Time Magazine, Sports Illustrated, and People) have been around for ages, and currently bring in just under 100 million active monthly readers. However, without mobile traffic, more people would visit About.com for their reading needs, and Time’s traffic would fall by more than 50%. Additionally, other information sites, like the Ask Network and Wikipedia, would fare better than Time’s network without mobile. 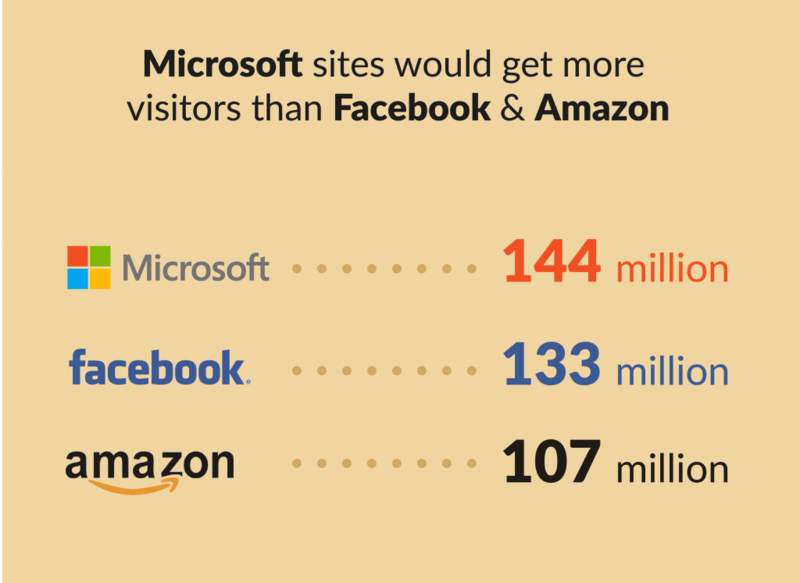 Microsoft would have more visitors than Facebook… and Amazon! While it’s not surprising that Facebook would lose a substantial amount of traffic without the existence of mobile Internet — about 70 million of its 203 million actively monthly users use mobile devices — it’s perhaps more surprising that Amazon would also take such a big hit. In fact, without mobile, Amazon’s shoppers would be reduced to 107 million, compared to 144 active visitors to Microsoft websites. Microsoft is one of the few companies we found that wouldn’t take an enormous hit without the existence of mobile, losing only about 20 million monthly visitors to its network of sites (including Microsoft.com and MSN). Compare this to Apple, who would lose more than 75 million visitors! Online radio service Pandora undoubtedly has become popular among mobile listeners, with over 82 million actively monthly music lovers. Without mobile Internet though, Pandora doesn’t even make the list of the 50 most popular sites online, which means it would stand to lose 60 million (or more!) users. 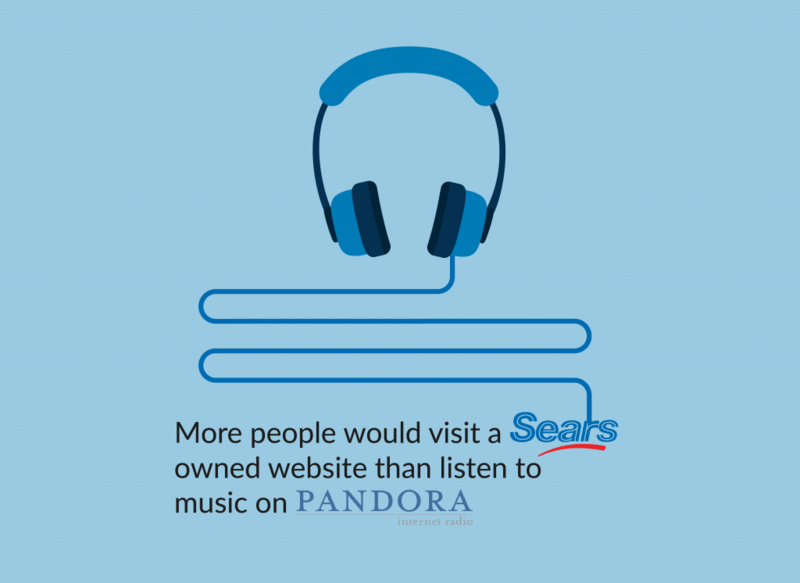 Without mobile Internet, more people would shop on a Sears-owned website (which includes Kmart) than listen to Pandora. More people would also plan trips with TripAdvisor and browse the Yellow Pages! Google easily tops the list of the 50 most popular sites on the Internet, boasting more than 237 million monthly visitors. 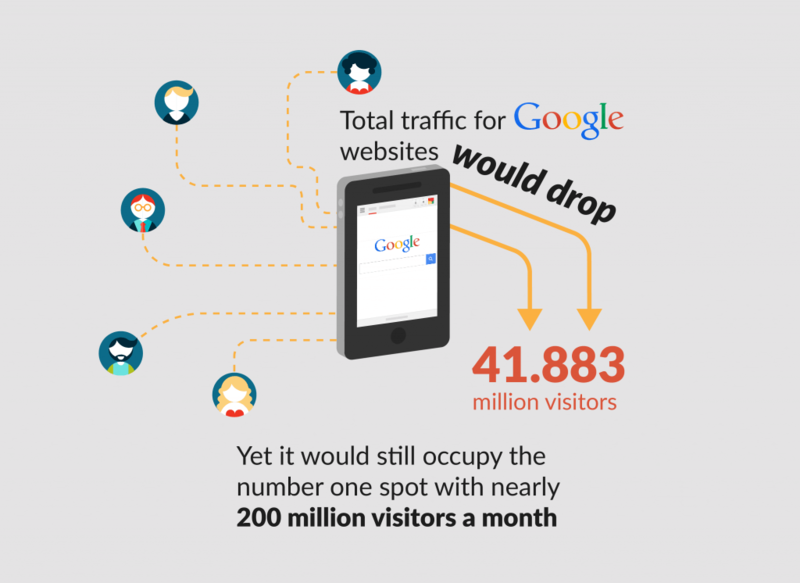 Without mobile, about 41 million of these visitors would disappear… but Google would still stick around in the top spot. It’s also worth noting that Yahoo! would also remain at #2, falling from 216 to 164 million monthly visits. Finally, the impact that the loss of mobile Internet access would have on social media would be enormous. Facebook’s monthly active users, as mentioned, would fall by about a third. 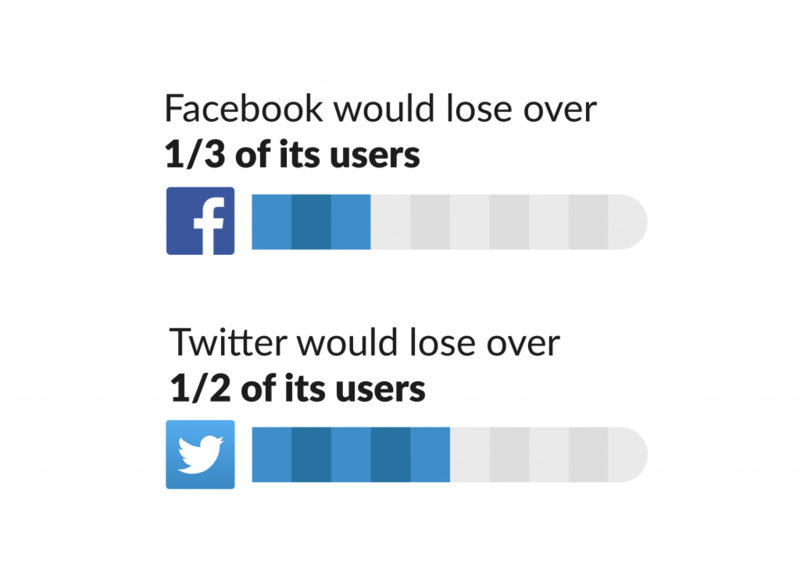 But it’s Twitter that would take the biggest loss of all, losing over half of its 88 million active users to retain just 36 million. How do other social media networks fare? LinkedIn would lose about 40 million visitors, and Pinterest would shed roughly 34 million. As we’ve shown, the Internet landscape would be dramatically impacted without the existence of mobile. Some services would lose a huge majority of their users, and some of the world’s most popular websites would miss out on millions of visitors. Thankfully, however, these findings are all simply theoretical. Mobile Internet is here to stay, and as we continue to embrace our mobile devices — and the idea of accessing our favorite sites on the go — it’s likely that websites will continue to see big increases in traffic from smartphones and tablets. What do you think of our findings? Which facts surprised you the most? Let us know what you think in the comments below!